Social media is filled with emotional awe inspiring real life moments guaranteed to bring tears to the eyes and reaffirm our faith in humanity. Feel good movies about actual events and struggles to overcome that are suffered by the victims and their families don't seem to fare as well with costumed superheroes or cataclysmic sharknados. Jake Gyllenhaal has played many flawed and complicated characters, but his portrayal of Jeff Bauman (whose book the movie is based) is probably the best he's ever done, obviously deserving of the early awards buzz. The Boston Marathon bombing has been already told in Patriots Day which touched on the various stories that affected those injured and those charged with finding the culprits. The focus of this story is about Jeff Bauman (Jake Gyllenhaal) who was at the finish line to cheer on his ex-girlfriend Erin (Tatiana Maslany). She was unaware that he was there as they broke up because he was never where he promised. She doesn't realize it until she sees him on TV being rescued. His family also learns of him from the TV and fill the hospital waiting room in the loud and raucous style of hard drinking working class denizens. 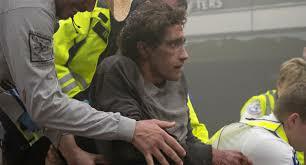 When Jeff wakes up, he indicates that he saw one of the bombers, which becomes a crucial clue to their capture. This makes him a hero in the public's eye. Jeff puts on a brave face and thumbs up attitude to his family and the hordes of reporters who want interviews, and regular people who want to thank him for his bravery. His mom Patty (Miranda Richardson) is so proud of her son wanting him to capitalize on the attention like interviewing with Oprah. In all the craziness, no one seems to clue in to Jeff's uncomfortable feelings with the added attention. It's hard enough to have to deal with the loss of his legs having to figure out how to maneuver to the 2nd floor apartment he shares with his mom, how to move around the tiny spaces, even using the bathroom without assistance. He is so grateful to Erin, who quits her job as a nurse to move in with him and help him get to his therapy sessions. He still continues to drink with his friends, avoiding confronting the trauma that he endured. His mom wants him to meet the man that helped him when he was laying injured at the bomb site. Carlos (Carlos Sanz) was at the race handing out American flags in honor of his two sons who had died. He had experienced depression and travels around trying to help others. His story helps Jeff come to grips with his fears and realize that's it's just not about him. The people who come to Jeff with their stories of loss and pain and how he inspired them finally brings him around. This isn't just a sweet pat ending to this story. Gyllenhaal's performance makes one cringe and fight with those demons along with him. He was just a Costco chicken roaster before all this, with not much ambition besides rooting for his favorite hometown teams. Suddenly, because of this tragedy, he's being asked to wave a flag at the Stanley Cup game on the ice and throw the opening pitch at the Fenway. Director David Gordon Green and screenwriter John Pollono crafted a well paced story that follows the journey of the reluctant hero through the thick and thin without overly sentimental violins wringing out the tears. The people surrounding Jeff, his mom, his dad (Clancy Brown), his brother and friends, and aunts and uncles are all well meaning and try to help but still enjoy riding the coat tails of his new found attention. Only Erin tries to keep the wolves at bay, but her patience wears thin when Jeff can't accept the news he's going to be a father. It must be tough putting all your flaws on screen. But it's worth it if it moves and instills that need to rise above the adversity and unite to be stronger.